In spite of a number of serious challenges, the Tunisian Constituent Assembly – under the people’s ever watchful eye – successfully negotiated a new and modern constitution. In 2011, the political class was far from prepared for the changes that had been forced upon them by the people. Important cleavages between conservative Islamist politicians on the one hand and liberal and secular politicians on the other complicated negotiations and grew worse over time. For a time, it was far from certain that the negotiating parties would be able to reach a final agreement. This was particularly true after the changes that took place in Egypt during June 2013, coupled with the assassination of three opposition politicians, as well as attacks against the country’s military (that were often attributed to a lax attitude by the ruling coalition against Islamist militants). During the fall of 2013, leading members of the opposition were calling for the government to be toppled and for the Constituent Assembly to be dissolved. One year after the assassination of Chokri Belaid in Tunis. Demotix/Adel Mhadhebi. All rights reserved. In the end, a series of negotiations took place to defuse the political crisis without any additional violence. The country’s main political forces participated in discussions that were brokered by the country’s largest trade unions, the lawyers association, and one of the country’s largest human rights associations (who were together referred to as the ‘Quartet’). Meanwhile, negotiations on the finalization of the constitution continued in a separate forum (see below). By successfully negotiating a final agreement, the Tunisians have led the way in proving that ideological differences need not lead to conflict or stalemate and that they can survive in the context of a modern Arab state and society. The pragmatic and result-based approach that the Tunisian negotiators adopted will serve as a positive example of successful constitution-making and conflict resolution not just for the Arab region, but for much of the rest of the world as well. Many of the difficulties that emerged were linked to the context in which the constitutional process took place, and also to the manner in which the Constituent Assembly organized its work at the very early stages. 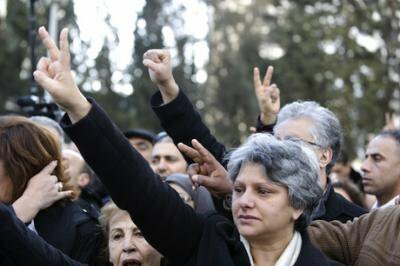 In Tunisia, as in all countries that were affected by the Arab uprisings of 2011, ruling elites and members of the opposition were caught completely by surprise and unprepared by the changes that were forced onto them by the people. Before the constituent assembly elections that took place in October 2011, senior state officials repeatedly argued that the new constitution was a purely technical document that could be drafted in a matter of months, reflecting their lack of understanding of how complex the process was likely to be, particularly given that Tunisia was just emerging from a harsh dictatorial environment in which basic freedoms, including free expression, were denied for decades. That lack of preparedness and of understanding also impacted on the manner in which the drafting process itself was organized. After the constituent assembly was elected, its members made the mistake of debating and drafting detailed provisions on the system of government and human rights without first having agreed upon the type of state that should be established, or the type of relationship that should exist between the state and the individual. South Africa, India and most recently Yemen are only some of the countries where the politicians took the time to negotiate what has been referred to as ‘fundamental principles’ before actually starting the process of drafting the constitution. Proceeding in that fashion makes sense for countries that start their transition to democracy without a good idea of what their state will look like in the future. In Tunisia, an early attempt was made to discuss the future state’s fundamental principles by a commission that was headed by Yadh Ben Achour in 2011. The text was considered to be disappointing to many, and did not play an important role during the drafting of the constitution that started in 2012. Details were discussed before fundamentals and for that reason, much time was lost. Drafters argued over how parliamentary procedure should be worded in the constitution more than a year before knowing whether the new state would be presidential, parliamentary or somewhere in between. When eventually a final decision was made, much of the initial drafting work had to be redone. The dominating political parties also made the mistake of assuming that constitutional drafting should be organized along similar lines to the ordinary political process and that therefore electoral results were the only or at least the main factor that should determine the negotiations’ dynamics (the same approach was taken in Iraq in 2005 and in Egypt in 2012). In the October 2011 elections, Ennahda (the main Islamist party) obtained the best result by far with 37% of the vote. Ennahda believed, as did its Islamist counterparts in other Arab countries who had also performed well in elections since 2011, that their recent electoral success should entitle them to determine the permanent constitution’s makeup regardless of whether they could maintain their level of popularity in the future. Ennahda’s position was more moderate than their Egyptian counterparts (possibly because, despite their success, they were nevertheless in a clear minority within the Assembly) and very quickly into the process conceded on a number of issues (most famously, Ennahda’s leadership dropped its insistence that the new constitution should refer to Sharia as a source of legislation). Despite that important move, the issue did not die as Islamist members continued to try to pepper the text with religious references. Thus, when the CA formed drafting committees to work on various parts of the constitution right at the start of the process, their makeup (and therefore the weight that was given to various positions) was determined solely by each party’s respective weight in the Assembly itself. Most importantly perhaps, the Assembly established a Joint Committee for Cooperation and Drafting which was theoretically responsible for coordinating the work of all the other drafting committees and for preparing the constitution’s final draft. However, as a result of the fact that Ennahda dominated the Joint Committee, its remaining members consistently complained that their views were being ignored, preventing the Joint Committee from making any progress on a number of fundamental issues. Eventually, in June 2013, more than 1.5 years into the process, as the country’s political divide deepened, it became apparent that the Joint Committee was unable to resolve most if not all of the points of disagreement that had already been outstanding for some time. In addition, a crisis broke out after it was discovered that the Joint Commission’s president made a number of important changes to the draft constitution without consulting the relevant drafting commissions. A decision was therefore taken to form a new body, known as the Consensus Committee, in which each political group was given equal weight to all others. Temporal electoral fortunes were suddenly rendered far less relevant, and members of the new Committee had to engage on a level playing field, in which the force of argument was given much more weight. The Constituent Assembly’s rules of procedure were eventually modified in order to allow for the Consensus Committee’s decisions to be properly considered by the Assembly as a whole. Finally, the other consequence of the Constituent Assembly’s purely political process was that no official role was granted to Tunisia’s many experts in constitutional law or to civil society. Thus, although hundreds of conferences, seminars and other meetings were organized and allowed for civil society to discuss constitutional issues with Assembly members, the latter were never under any obligation to listen to anything that was being said to them. In contrast, the Kenyan constitutional process involved the establishment of a “committee of experts”, six of whom were nationals and three internationals, all of whom were vetted by the African Union’s council of elders. That committee of experts played a crucial role in ensuring that modern constitutional practice from around the world was reflected in the drafting process right from the start. The tradeoff was that politicians often had little understanding of what was being included in the constitution, and have since been involved in an effort in undermining its application. The absence of any equivalent arrangement in Tunisia meant that although the politicians felt that they owned the process, experts and civil society organisations had no option but to continually lobby members of the Constituent Assembly on the same issues, and had no recourse in the event that reasonable and convincing ideas were rejected by the MPs for purely political reasons. Hence, by way of example, it took months to convince the members of the relevant committee to include a limitations clause in their draft, despite the fact that such clauses have become synonymous with progressive constitutional drafting around the world. When the Assembly finally understood what the limitations clause was designed to achieve (see below), they resisted its inclusion for close to a year, fearing that the future parliament’s law-making power could be curbed. Significant time and effort was wasted as a result, contributing to a general state of discontent amongst the general population. In the end however, the Tunisian’s success is deserving of considerable praise mainly because a final agreement was reached in the absence of significant violence (relative to other countries in the region), because of perseverance in reaching consensus and ownership, because of the progress that was made in comparison to the 1959 constitution, and in comparison to the other constitutional systems that exist in the region. What follows is a discussion of some of the new constitution’s most important areas, by no means designed to be a comprehensive review of the entire text. Deputies celebrating the ratification of the new constitution for Tunisia. Demotix/Mohamed Krit. All rights reserved. Many observers have complained that the constitution’s provisions on the nature of the state and on its relationship to religion are contradictory and may lead to significant disputes in the future. By way of example, Tunisia maintains a state religion, but notes nevertheless that the people are the source of legitimacy. Although there is certainly a compelling argument that some of these provisions are inherently contradictory, the reality is that the negotiating sides are unlikely to have been able to reach a better arrangement in the circumstances, particularly given the important difference in opinion that existed between them. Constitutional drafters the world over often seek to resolve irreconcilable differences of this type by making use of ‘constructive ambiguity’, which effectively defers the matter to a later date while at the same time allowing the constitutional debate on other issues to continue. The issue of gender equality was also highly charged from the start of the drafting process; the fault lines were predictable, with Islamists wanting to see their conservative view of traditional family life generalized throughout state and society, and more secular and liberal Tunisians wanting either to protect whatever rights had been acquired under the previous regime or take them even further. In that respect, the constitution’s first draft, which was published in late 2012, raised a large number of eyebrows with its reference to women as being “complementary” to men. Many progressives cried foul at the time, and applied continuous pressure on the issue throughout the remainder of the process. The constitution introduces a number of elements that will be crucial for women’s rights in the future. Firstly, article 46 introduces the concept of “acquired rights”, which the state must now work to “strengthen and develop”; in other words, women’s rights as they stand today are now considered to be a minimum standard that the state cannot retreat from and that it can only work to improve. The Tunisian constitution also follows the lead that was introduced by the new Egyptian constitution, which for the first time recognizes the problem of discrimination and violence against women. But whereas the Egyptian constitution was vague in terms of the objectives that are supposed to be achieved, article 46 specifically provides that the state must work to achieve “parity between men and women in elected assemblies” (although it is worth noting that the specific wording that was adopted in this clause makes it unclear whether this is an actual obligation, or whether this is merely an aspiration that the state should strive towards). The constitution is also probably the first in the region to introduce gender sensitive wording in relation to key issues. So for example, although most Arab constitutions provide for a right to work, the relevant provisions are almost invariably drafted in a way that could suggest that the right is only reserved to men. In article 40 of Tunisia’s new constitution however, the right to work is now “a right for every citizen, male and female”. Gender sensitive wording is also used on the right to decent working conditions, to a fair wage, and to the right to stand for election. Perhaps most importantly article 73 provides that “every male and female voter” has the right to stand for election for the position of President, certainly a first for the Arab region. Although these provisions are probably most progressive in the Arab region in terms of gender rights, it must be said that they fall short of real equality. What they enshrine is a requirement for the state to treat men and women equally in application of the law, but that obligation does not and will not require men and women to have completely equal rights in all circumstances, particularly in those areas where Islamic tradition has provided that men and women should be unequal (namely inheritance, and child custody rules). As expected, the new constitution also contains a long list of rights and freedoms, including the usual political, social and economic rights. Many of these are familiar (including right to free speech, assembly, association, work, education, health, etc. ), while others are more innovative, such as the many references to the right to a clean environment (article 45) and the establishment of a sustainable development commission (article 129). The majority of these rights is expressed in just a few words each, and says very little about how these rights are to be exercised or what types of exceptions might be made. Modern practice in developing nations demands that constitutions set out a few lines on each right, to guide citizens and the state on how far each right extends. Instead, what the new Tunisian constitution does is that it incorporates what is probably the Arab region’s most detailed limitations clause (article 49). Limitations clauses are designed to prevent parliaments from arbitrarily, unfairly or inequitably curbing citizens’ rights. They were first introduced into comparative practice more than half a century ago after governments around the world used loopholes in constitutional frameworks to pass legislation that took away from the very essence of all the fundamental rights that were provided for in national constitutions. Over time, countries have learned from each other, and limitations clauses have become increasingly sophisticated over time. The most recent manifestation was in Kenya, which itself built on South Africa’s experience, amongst others. The dictatorial regimes that ruled over the Arab region since nominal independence was achieved in the 1950s also became expert at granting generous fundamental rights in their constitutions and then removing all meaning from those rights through legislation. Based on that experience, and on the significant developments that have taken place around the world in this same area, it would have been natural to expect for the Arab region to build on those developments and adopt sophisticated limitations clauses of their own. However, despite all the attention that has been given to this area, Tunisia appears to be the only country to have taken the issue seriously. As noted above, the drafting process was difficult given that the Constituent Assembly’s members were not familiar with the concept of limitations clauses in any shape or form at the start of the process, and when they finally did understand what it entailed, they were overly cautious at what type of impact it could have on their parties’ future ability to legislate. Nevertheless, as a result of significant pressure from all sides, article 49 now states that legislation curbing rights can only be passed if it is “necessary to a civil and democratic society” and the nature of the restrictions that the legislation envisages must be proportional to the objectives that the legislation seeks to achieve. Regrettably however, article 49 also lists the objectives that legislation can seek to achieve when trying to curb rights, a number of which are excessively vague and broad. They include “protecting the rights of others,” “the requirements of public order”, “national defence”, and “public health or public morals”. The manner in which these exceptions are listed (particularly the references to public order and morals) means that the potential for abuse remains much larger than it need be. The fact that the constitution is very short on rights, and the fact that it contains a detailed limitations clause significantly increases the burden on the courts in Tunisia’s new constitutional framework. If the political process fails the people and produces a pliant parliament and an overbearing executive that is intent on curbing rights, the constitution will be heavily reliant on judicial review, as the only mechanism to limit overreach by the elected branches. The only exception is the Human Rights Commission, which is established by virtue of article 128, but which also in any event depends on the courts to have any impact. In this regard, there is significant cause for concern, because the constitution’s system of government leaves open several potential avenues for abuse. Like many countries in the Arab region and elsewhere, Tunisia opted to establish a semi-presidential system of government, in which the president and the parliament both have significant power over the government formation and dismissal processes, and in which neither the parliament or the president can fully dominate the other. During the drafting process, significant attention was given to the security sector and who should be responsible for providing instructions and for overseeing its actions. The main issue was accountability: whoever was given power over security-related institutions should be subject to significant mechanisms through which he or she could be held responsible for any wrongdoing. In that respect, the final constitution is not particularly reassuring: it provides that the president is the commander in chief of the armed forces (article 77); that the president is responsible for appointing and dismissing senior military and security officers (article 78); and states that the president is “responsible for national security” (article 77) without providing any detail at all as to what these powers entail. In addition, article 80 provides that in the event of “imminent danger”, the president may take “any measures”. In 2012, constitutional drafters in Egypt were so nervous about a possible return to Mubarak-era practices that they set out specific time limits for states of emergency and imposed the requirement that a referendum take place to allow for any exceptional powers to continue past that time limit. Paradoxically, the Tunisian drafters appear to have taken a far more relaxed attitude towards this issue, despite the fact that the potential for abuse is still very real. What is particularly concerning given the above is that there is only one mechanism through which the president can be removed during his term of office, which is impeachment by virtue of article 88. The difficulty is that in order for such an initiative to be successful, it must be supported by two-thirds of the parliament’s members, which will be very difficult to reach in most circumstances. In effect, what that means is that if the president controls at least one third of the parliament, there would be no constitutional mechanism through which he could be removed from office (apart from term limits), even if he attempted to abuse his control of the security forces. Although a two-thirds majority is not an unusual threshold for directly elected presidents, it would have been natural to expect more mechanisms to protect against potential abuse of the security sector particularly given Tunisia’s recent history (for example by creating a clear division of responsibility between the president and the ministry of defense, and by allowing for the minister to be replaced by parliament through a lower majority requirement than for the president). As a result, the courts’ role in curbing the powers of the executive becomes even more crucial. In that context, protecting judicial independence and ensuring that the judiciary remains as professional a body as possible are key. One of the key innovations that the constitution introduces is the establishment of a constitutional court, which is now tasked to resolve major disputes on the constitutionality of legislation. During the drafting process, there was significant dispute between the drafters as to how the court’s members should be chosen and it was decided in the end that the president, the parliament and the supreme judicial council should each be responsible for nominating four judges (article 118). The rationale behind this rule is firstly to prevent any single institution from dominating the court, and secondly to ensure that all of the main branches of government will have a stake in the court’s success, thereby granting the constitutional court itself significant amounts of legitimacy. Pursuant to article 118, the supreme judicial council’s role becomes crucial, given that its appointees will be the only ones who will not be appointed by a political office. A growing number of countries around the world have judicial councils, which are typically responsible for managing the judiciary’s inner workings. Each country has different rules for how its judicial council is composed and how it operates, and an increasing number of constitutions provide significant detail to ensure that the councils cannot be tampered with by subsequent legislation. In that respect, Tunisia’s new constitution has a number of gaps that create significant cause for concern. For example, article 118 does not indicate how the supreme judicial council will choose its appointees to the constitutional court; is it through an internal electoral process, or will the head of the judicial council play a dominating role in the selection process? The way in which the council itself is composed is also somewhat confusing. Article 112 provides that the majority of its members is elected, but does not say by whom. It also says that a third of the council’s members should be made of “independent, specialized persons who are not judges” but says nothing about what criteria should be applied for selecting those individuals. Article 112 provides that all these issues are to be determined by legislation, which means that the ordinary political process will be empowered to determine matters of critical importance that could impact on the entire framework’s ability to function. Although the Assembly members here and elsewhere appear to have been motivated by a desire to leave much of this detail to the implementation phase, there is a danger that some of the gaps that have been left open may be exploited in the way that the previous constitution was. The constitution also includes a number of innovations that draw from successful precedents in other countries. The best example is article 60, which provides that the parliament’s powerful finance committee (which is responsible for reviewing the state’s annual state budget before it is voted on in parliament and for assessing whether the state’s monies are being used wisely) should be headed by a member of the opposition. This is based in large part on a practice that has been in place for some time in the UK’s House of Commons, in which the Public Accounts Committee is by convention always headed by a member of the opposition. The rationale is simple: one of parliament’s essential functions is to exercise oversight over the executive branch of government and that cannot be done if the parliamentary majority, which will almost always be sympathetic to the government, is also in control of all important legislative committees, including the finance committee. The constitution has now resolved this problem through a simple, common sense measure which will serve the country well. What is also interesting about article 60 is that it explicitly recognizes that the parliamentary opposition is an “essential component” of the legislature. Although this may be obvious to established democracies, in Arab countries that are not dominated by single families or one party states, most political parties prefer to avoid political disputes by establishing “governments of national unity” (governments that include all parties that have parliamentary representation). Iraq and Lebanon have proven what is wrong with the practice, including how ministerial accountability is practically non-existent as a result. 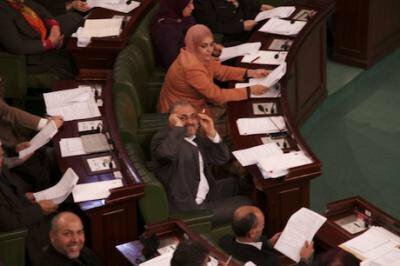 Tunisia appears ready to embark on a different and more democratic path, one in which parties can accept to be part of the opposition and where they can be allowed to play a genuine and positive role in governing the country and improving governmental performance. On the other hand, the constitution does not go far enough in establishing the basics of a functioning decentralized system of government. Traditionally, Arab states have been amongst the most centralized in the world, with everything being decided in the capital by a handful of unaccountable senior officials, and most public investment being concentrated in a few (already relatively prosperous) areas. The system on decentralization is inadequate given that little indication is given on how it will function and what the decentralized levels of government will actually be doing. The constitution does provide that local councils will be elected, but the same is provided for in Iraq and in Egypt and by itself has not brought about any significant changes in the delivery of services in the provinces. The one significant innovation in Tunisia in that regard is the establishment of a high council of local authorities (article 141), which will create an important forum to discuss local issues, something that is desperately lacking in just about every other country in the Arab region. Most Tunisians agree that their new constitution is an advance, despite the imperfections. They also agree that what matters most is what happens at the implementation phase, and in this sense there is significant cause for reassurance. What the Tunisian people have demonstrated time and time again is that they are far more aware of what direction their country should be heading in than the politicians. Since the start of the revolution, they have been at a heightened state of alert, and have called out any attempt to abuse power by the country’s new class of politicians. The people’s new democratic spirit is what will make Tunisia a success, and it will hopefully serve as an inspiration for the entire Arab region in times to come.